Manxman Dan Kneen will not take part in tomorrow’s second Sure Supersport TT after injuring his back yesterday in a highside at Governor’s Bridge when he hit a damp patch. The The Marks Bloom Racing rider was putting in a superb ride on the GSX-R600 Suzuki and was lying in an excellent fifth place after passing John McGuinness on corrected time when he crashed out on the third lap, crashing on the exit of Governor’s Bridge with just one lap of the race remaining. He hopes to be back for Friday’s Lightweight and Senior races. "The race was going really well and apart from Michael Dunlop coming past me, it was just me and the circuit. The little Suzuki was working really well and I was inside the top six but just as I was about to start the final lap, I got caught out by a small damp patch at Governor’s. 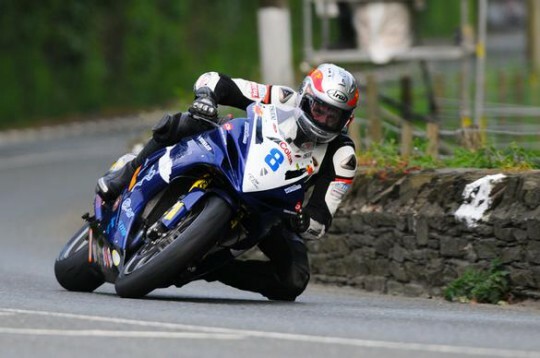 It had rained on Sunday and with Governor’s always being slippy due to the overhanging trees, there was just enough of a damp patch to cause me to highside," said Kneen, speaking to bikesportnews.com. "The bike took a battering whilst I landed on my back and am pretty bruised and it was such a shame as I was on course to equal my best result - if I’d have kept going, I could have got fourth too as race leader Gary Johnson ran out of fuel. Obviously it put me out of the Superstock race later in the day and my back’s pretty sore and swollen and there’s a couple of squashed vertebrae so I’m not sure if I’ll be able to get out again this week. I certainly won’t be in the second Supersport race on Wednesday but if I can, I’ll try and get out on Friday for the Lightweight and Senior races. I’ll just see how I feel and take it day by day."